As rumors of big mortgage companies' collapse swirl, many Americans are unable to find affordable home loans. 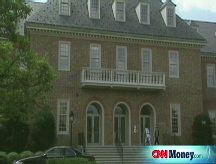 NEW YORK (CNNMoney.com) -- The fate of Fannie Mae and Freddie Mac may be hanging in the balance but many mortgage borrowers already find themselves struggling to find affordable loans. Because of the turmoil surrounding Fannie and Freddie, recent borrowers are likely paying at least 10% more in monthly mortgage payments than they would have. The added cost stems from an erosion in confidence in Fannie and Freddie, according to Mark Zandi, chief economist for Moody's Economy.com. Fannie and Freddie borrow money in the bond markets to pay for the mortgages they buy from lenders and then sell them to hedge funds and other investors. Their cost of borrowing that money has now gone up, and that filters down to lenders who have to charge more to borrowers. "It does have an impact on mortgage interest rates," said Richard DeKaser, chief economist for National City Corp. "It will be more expensive for Fannie and Freddie to acquire mortgages and that will ripple through the market." Indeed, borrowers have been spending more for mortgage loans than usual ever since credit markets went through an upheaval last summer. Before then, the interest rate on a 30-year, fixed-rate mortgage was about 1.5 percentage points higher than yields on 10-year Treasury notes, according to Keith Gumbinger, vice president of HSH Associates, a publisher of consumer loan information. Treasuries are a benchmark for mortgage rates. Now, the difference is closer to 2.5 percentage points and has expanded by about a 0.3 percentage points since late June, as angst over the futures of Fannie and Freddie reached fever pitch. With their stock prices plummeting and concerns accelerating over their financial well-being, "Their cost of borrowing money is definitely going to be higher," said Gumbinger. And mortgages are not only getting more expensive for ordinary borrowers but they're also harder to obtain as lenders tighten up their standards. "Some lenders are really pulling in their horns," said Steve Habetz, a Connecticut mortgage broker. "They're getting scared. They're demanding really clean loan applications with every i dotted and every t crossed." What is happening now is compounding the damage which has already devastated the housing market. The troubles for Fannie and Freddie could even affect current mortgage borrowers since they put the housing rescue bills that Congress has been agonizing over for months in jeopardy, according to Zandi, who has testified before the Senate on aspects of the bills. Congress has upped the value of the loans Fannie and Freddie can buy, as well as the total dollar amount they can hold. And a bill in the Senate calls for an expanded effort by the Federal Housing Administration to insure risky mortgages. Fannie and Freddie are being called upon to cover the potential cost to taxpayers. Now their weakened position calls into question their ability to do so. "The ability of [Fannie & Freddie] to become more aggressive in extending credit, which is what the policy makers hoped and planned for, may be compromised," he said. "It could further delay any housing recovery."